Having a little trouble getting this post started. Aside from being a coffee-shop review, which I’m still working on getting accustomed to, I had a bit of a late night after my trip to the theatre last night, drinking my way thru an impromptu HELL’S KITCHEN marathon when I really should have been writing. Or, you know, sleeping. This led to a somewhat pained shlep through the drudgery, momentarily interrupted by LIFE-ALTERING NEWS which I’ll tell you about some other time, because who cares, right? And anyways, for the moment I’ve got to finally kick this hangover headache and get to some good old fashioned theatre bloggery! 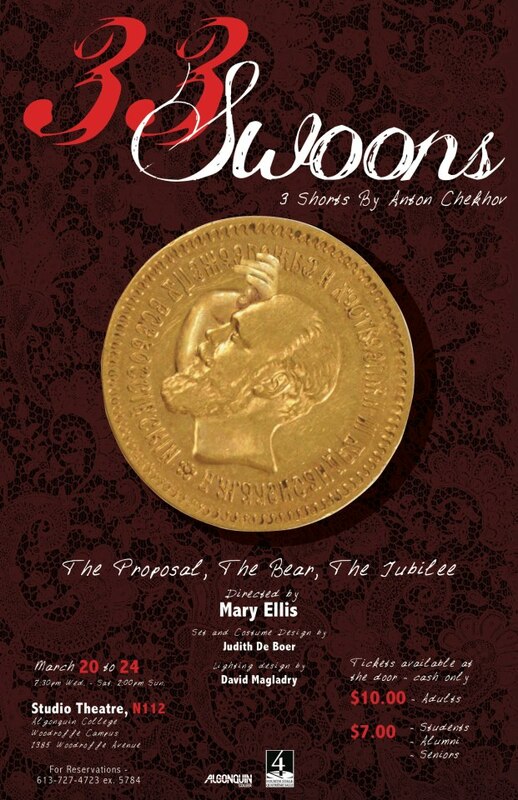 Last night, as every concerned citizen is aware, was opening night for the second of three shows in the current season from Algonquin Theatre Arts, this time featuring a triple threat of short works from that zany romantic himself, Anton Chekhov. Collected under the title of 33 SWOONS (supposedly that’s how many times characters swoon, flail, and just generally suffer from the vapours over the course of the shows…I didn’t count, myself), the evening featured three of Chekhov’s rom-com classics back to back, all courtesy of director Mary Ellis. All three shows use the same group of actors, 5 different up’n’comers who have a grand old time bringing these time-tested, beautifully written, and goofily hilarious plays to life. First up is THE PROPOSAL, with Jonah Lerner as bombastic Stephan Stepanovich, who is entertaining young neighbour Ivan Vasilyevich (Phil Hughes). Stephan has designs on Ivan’s lovely daughter Natalya (Erin MacDonald), and papa is all for the match…a misundertanding about a land claim has the three of them at one anothers throats. Heart palpitations and fainting spells abound, curses are hurled, and perfectly awful things are said about a couple of dogs. Will love prevail? The second show, THE BEAR, features weeping widow Yelena Ivanova Popova (Caitlin O’Brien), who insists whe will spend the rest of her life lamenting her late, good for nothing husband, much to the consternation of her doting servants (Erin MacDonald, again, and Jeremy Piamonte). Into her perfectly gloomy life stomps Grigory Stepanovich Smirnov (Phil Hughes, again), a woman-hating soldier here to collect the rubles Yelena’s late husband owes him. Lines are drawn, threats are made, and pistols are drawn in a potentially literal battle of the sexes? Will love prevail?? And finally, THE JUBILEE brings us a suffering, grumbling bank clerk (Phil Hughes, one more time), slaving away to finish a report for his egomaniacal boss Andrey Andreevich Shipuchin (Jonah Lerner, again). Interference arrives in the form of Shipuchin’s equally self-obsessed wife Tatyana (Caitlin O’Brien, again), and determined if somewhat deranged Nastasya (Erin MacDonald, one more time), seeking her ailing husband’s missing wages in all the wrong places. Voices are raised, knives are drawn, faints are fainted, and the reports due date is looming nigh!! Will love prevail..? Well, okay this one’s not about love, per se, but…will that clerk-guy finish the report??? Thank you for the kind words! I’d just like to mention to avoid confusion that for the proposal, you have the character names of Phil and Jonah reverse. Phil Hughes (the wannabe husband) is Ivan Vasilievich, and Jonah is Stepan Stepanich Chubukov. Thanks! Zoinks! Corrected, thanks for the heads-up.